Walking down the aisles of a tackle store, you will most likely encounter several different choices of fishing line. The line can be fluorocarbon, monofilament, or some type of braided material in multiple colors. One of the biggest questions anglers have is whether fish can see line. As a serious angler, I have used them all and have developed a good understanding of when and where to use each of them based on personal experience, manufacturer claims, and available research. As mentioned, there are three major types of fishing line. Each has its benefits and should be included in your arsenal. When it comes to being seen underwater, here is what I have found out about each one. Fluorocarbon line is touted by line companies as the most invisible line on the market. It is said to have the same light refraction properties as water, making it virtually invisible or as invisible as fishing line can get. Fluorocarbon line offers many advantages to anglers, with the invisibility being among the best properties of this type of line. It is well suited for all water clarities. This near-invisible quality of the line is the way to go in ultra-clear water and, theoretically, will lead to increased bites from spooky fish that are used to seeing line connected to lures. Manufacturers who make pink fluorocarbon lines claim that this tint of line is hard to detect underwater. While it may be hard to believe since they are very visible to anglers, there is some truth to their claims, especially with pink lines. Scientific studies and first hand accounts of divers underwater have shown that pink loses its color at various depths. It works to blend in with the water and becomes clear to fish. While it may seem unusual to tint a line type like fluorocarbon that is said to be virtually invisible, by all accounts, pink line loses its color and is hard for anglers and fish alike to see underwater. 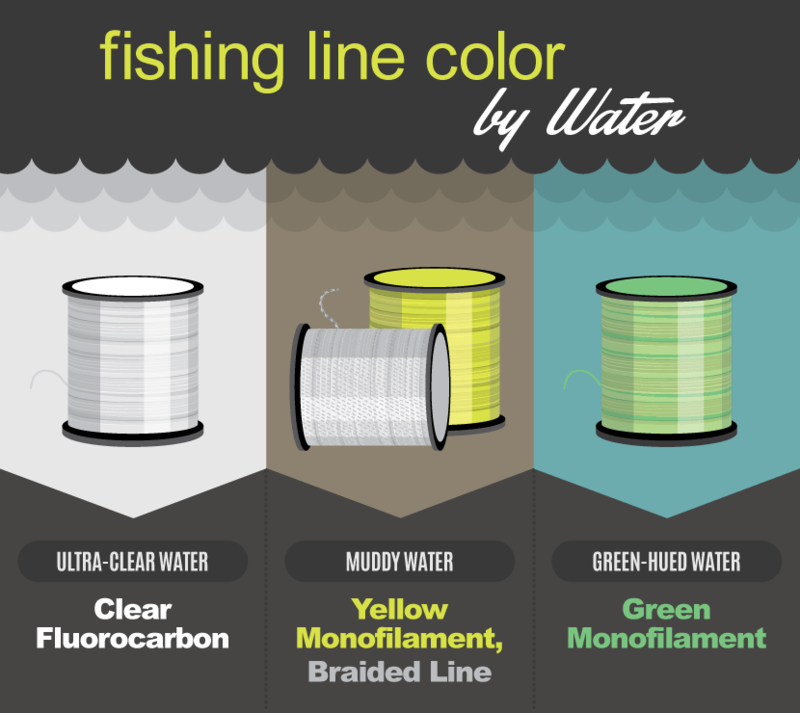 Monofilament is the most popular line choice on the market and it comes in several different color options. Nearly all of them are marketed as either being hard for fish to detect underwater or easier for anglers to see above water. 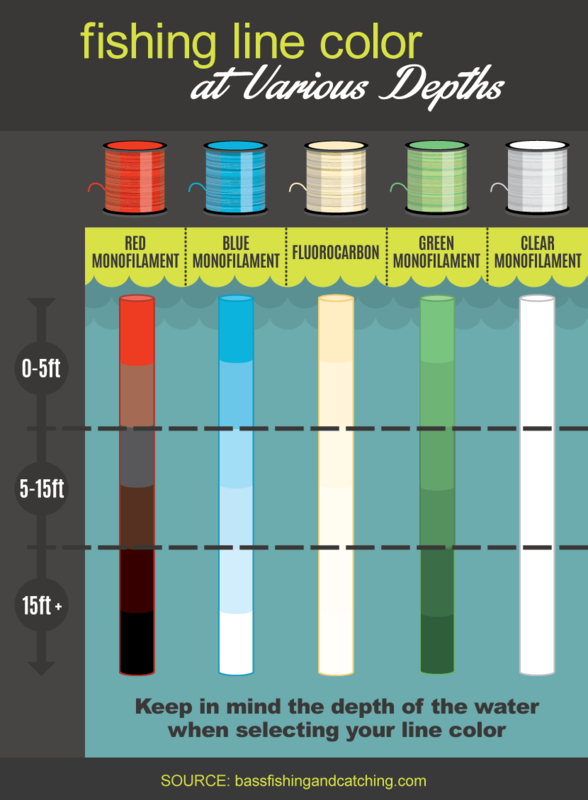 Here is a breakdown of the most popular colors of monofilament lines and the benefits of each. The high-vis yellow color is great for anglers who watch their line to detect bites. The bright color makes it easy to see from above and slight bites are easily noticed. The downside is that it’s more visible to fish below. This color of line is a good choice for dirty water, but in clear water the line is fairly easy to see underwater. It’s a trade off for anglers looking to see their line, and adding to the equation is that aggressive fish may not notice the line as they are about to strike a lure. Yellow line does have a time and place and the benefit of being able to detect bites may outweigh any possible reduction in bites from line-wary fish. Red lines are also said to become invisible underwater. This comes from the studies that show how red objects lose their color first underwater. On the other hand, divers say that red objects that lose their color become black. Those who use red lines also like the fact that they are easy to spot above water. Adding to the confusion surrounding red line is that companies who produce red hooks say that they generate more bites since they look like blood. Many anglers find it hard to believe that red line is invisible, but red hooks are somehow more visible. Either way, red line is an option for anglers looking for another choice of line color. Green is a good color for blending into the water. The majority of water we anglers fish have some sort of green tint to it. Like camouflage, green line blends into its surroundings and makes a good choice for anglers looking to keep their line invisible to fish. On the other hand, green may be more visible than clear in very clear water. Overall, green is a good line color choice for many different situations. Clear monofilament is a good choice if you are concerned about fish being able to see your line underwater. While the properties of fluorocarbon may make it less visible underneath the surface, clear monofilament works well in all situations. There is another clear option on the market, and it is typically called clear blue. The line is relatively clear underwater, but the blue tint makes it easier to see above water. While there are many benefits to using braided line, being undetected by fish is not one of them. Braided line offers excellent strength for a thin diameter, casts extremely far, and also does not stretch. These properties make braid an excellent choice for fishing around heavy cover and in dirty or muddy water conditions. 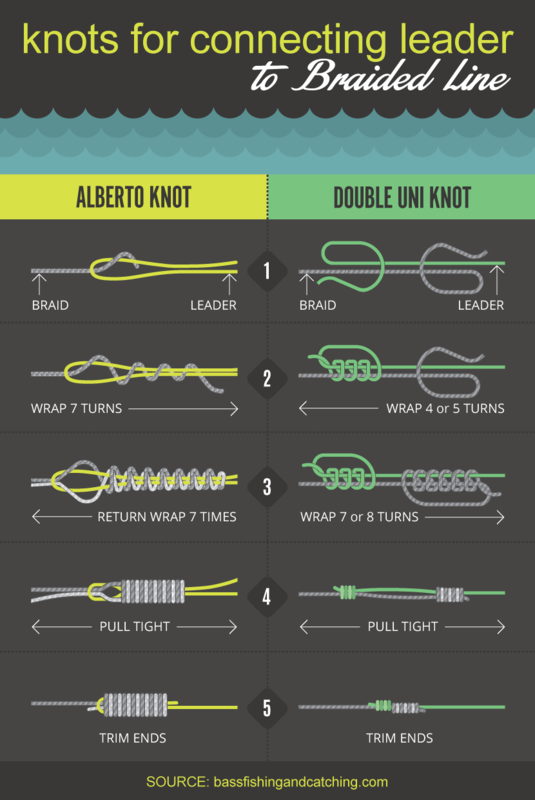 To get the most out of your braid in clear water, use a leader of fluorocarbon joined by a Double-Uni or Alberto knot. This allows anglers to have the best properties of both types of line, strength and invisibility.